The Rams boy’s tennis team had a busy week opening up conference play. “When you talk about OK Red competition, you have to understand the history of the OK Red. The Red is fierce; the red is like the Wild Wild West. Every match is a battle to the finish and is understood and embraced by everyone involved. The Rams have the utmost respect for their conference foes and look forward to the intense rivalries that have developed over the years.” Said coach Tom Huizing. On Monday September 11th, the Rams traveled Grandville for a match with the Bulldogs. After last year’s 4 -4 tie both teams were looking forward to this year’s match. Just like last year, the Rams jumped out to a quick 3 – 0 lead with straight set wins at 1st Doubles (Matthew Hall and Ryan Blackburn), 3rd Doubles (Will Lewis and Caleb Werdon), and 3rd Singles (Ben Howard). 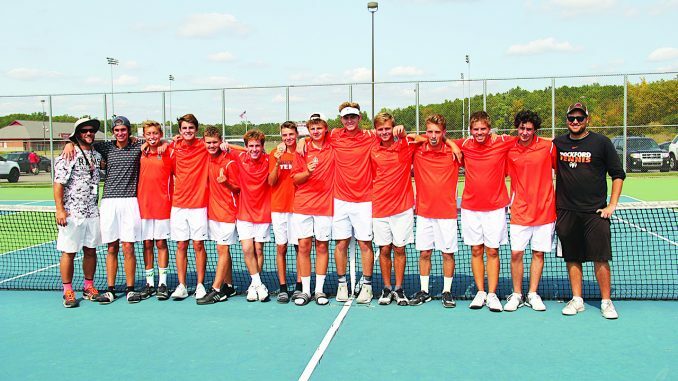 The Bulldogs are an experienced and well coached team that loves to battle and they dug in, forced 4 of the 5 remaining matches into decisive third sets, and moved ahead of the Rams 4 – 3. After seeing the Bulldogs come back and take the, the pressure all shifted to the 4th Doubles match. The Ram duo of Jackson Danner and Nate Boer pulled out a nail biting 6-4 third set win to end the match again in a 4 – 4 tie…next year. The Falcons of East Kentwood were on the schedule for Wednesday September 13th. A delay in the court resurfacing project at East Kentwood gave the Rams a surprise home match and they took full advantage with an 8 – 0 win. Even though the team score was lopsided, the Falcons battled to the last point of every match. Winning key hard fought matches for the Rams were Johnny Mellin at 2nd Singles and Joseph and Nick Besta at 2nd Doubles.